This card was pretty easy to make. 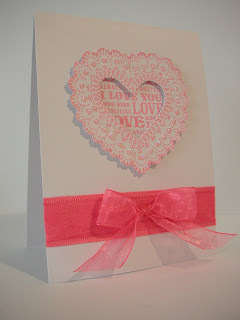 I love this doily stamp, I stamped it on a separate piece of white card, carefully cut it out and cut out the small heart in the centre. I highlighted some details on the stamp with dots of glue and sprinkled some diamond dust glitter on it. On the main card I stamped the text directly. I added a strip of pink grosgrain ribbon, a strip of pink organza ribbon and a organza bow. I attached the heart doily with some sticky back foam pads. Rubber Stampede Large heart doily, Studio G Love Always and Forever. Fun quilled Sheep and Shamrocks!